Monday's A.M. Hot Clicks features Charlotte McKinney as lovely lady and takes a look at the tactic Michael Jordan is using to sell his Chicago mansion. ​Michael Jordan's $15 million Chicago suburb mega-mansion is up for sale, and he's using the most MJ sales tactic ever to get it sold. Adrian Peterson nearly missed Sunday's game after allegedly swallowing his chewing tobacco on a bumpy flight ... Rex Ryan was livid about the Bills' headset problems. Turns out they just needed to change the batteries. It was not a great day for Rex ... Cole Beasley's wife went all expletive while defending her husband on Twitter ... Greg Hardy and Dez Bryant nearly fought on the Cowboys sideline ... Ryan Tannehill was perfect in Miami's win over Houston ... Kirk Cousins may have finally won over the D.C. fanbase ... Colts owner Jim Irsay got into a postgame shouting match heated conversation with GM Ryan Grigson ... Mark Ingram busted out the Hotline Bling dance (whatever that is) against Indy ... Ryan Mallett keeps messing up. These are excellent. The Bulls and Mavs are my favorite. "You’re about to get on a plane to Seattle. You want to know if you should bring an umbrella. You call 3 random friends of yours who live there and ask each independently if it’s raining. Each of your friends has a 2/3 chance of telling you the truth and a 1/3 chance of messing with you by lying. All 3 friends tell you that ‘Yes’ it is raining. What is the probability that it’s actually raining in Seattle?" And that's one of the easier questions! 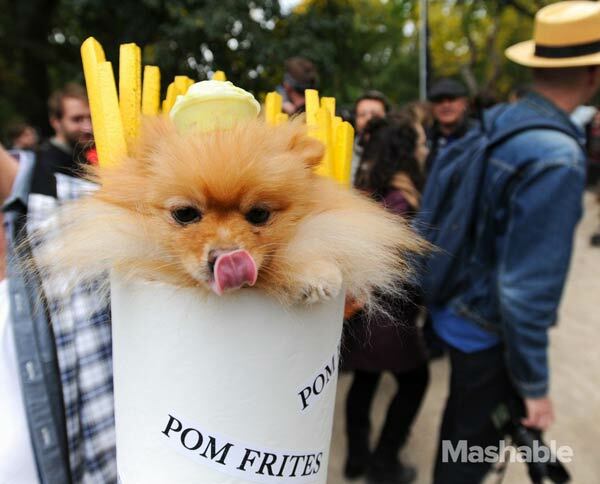 Scenes from NYC's annual Tompkins Square Halloween Dog Parade. Forget Ovi. I Love Batgirl. Someone is selling Mets World Series tickets for a million dollars each ... For those not paying attention to hockey, Montreal is off to a 9-0-0 start ... Kevin Garnett had a great tribute to the late Flip Saunders ... Ten college coaches most likely to make the jump to the NFL ... The best signs from ESPN's GameDay ... A day in the life of Mr. Met ... One of the candidates to replace Sepp Blatter as FIFA president is named Tokyo Sexwale ... Greg Oden got injured again in China ... Rondae Hollis-Jefferson bought his mom a new house ... Two Alabama fans got married at Saturday's pregame tailgate ... The world's highest paid comedians of 2015 ... This dude set off a stink bomb at a Maryland convenience store ... I'm somewhat obsessed with drug tunnels. A 2,400-foot version was just found along the U.S.-Mexico border ... Ten things South Park has taught us about gentrification ... You know it's a Flo Rida concert when a 62-year-old white dude goes stage diving. SI Swimsuit model Kelly Rohrbach, who used to play golf at Georgetown, offers some tips for the perfect golf swing. The former Heisman Trophy winner dropped by Alabama basketball practice and showed off his southpaw stroke. Price is Right model (and former LLOD) Amber Lancaster had an embarrassing moment during Friday's show. Screen Rant found 10 great movie bloopers, including that time Luke Skywalker accidentally called Princess Leia by her real name.